The sentiment in the Modern Indian art market continues its positive trend since May 2012. 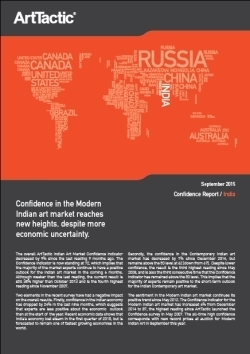 The Confidence Indicator for the Modern Indian art market has increased 6% from December 2014 to 87, the highest reading since ArtTactic launched the Confidence survey in May 2007. The all-time high confidence corresponds with new record prices at auction for Modern Indian Art in September this year. Two elements in the recent survey have had a negative impact on the overall results. Firstly, confidence in the Indian economy has dropped by 24% in the last nine months, which suggests that experts are less positive about the economic outlook than at the start of the year. Recent economic data shows that India’s economy lost steam in the first quarter of 2015, but is forecasted to remain one of fastest growing economies in the world. Secondly, the confidence in the Contemporary Indian art market has decreased by 7% since December 2014, but remains above the 50 level at 62 (down from 67). Despite lower confidence, the result is the third highest reading since May 2008, and is also the third consecutive time that the Confidence Indicator has remained above the 50 level. This implies that the majority of experts remain positive to the short-term outlook for the Indian Contemporary art market. The report includes confidence rankings and analysis of individual Indian Modern and Contemporary artists.